This taco salad tastes just like a restaurant style take out treat, but it's made with minimally processed plant based ingredients so you can feel even better about making it an everyday kind of meal that will keep you feeling happy and healthy. I first tried a vegan taco salad made with raw walnut meat at a local raw vegan cafe near by and it completely blew my mind. The flavored walnut crumbles reminded me of the fast food tacos from my childhood, with all the right spices and the perfect crumbly texture. While it was super delicious, it was also covered in oil and contained way more walnuts in a single serving than I would normally consume, and my skin was not happy about it. Since that version was a little too nut heavy for me, I set out to create my own more vegetable-based recipe using riced cauliflower and a moderate amount of walnuts and it turned out to be just as good! I didn't feel like using my food processor this time, so I chose to use thawed frozen riced cauliflower and I quickly chopped the walnuts by hand. Then I mixed them together in a bowl with some spices and tamari. If you are working with whole fresh cauliflower then all you'll need to do it chop it into florets then add it into the food processor and pulse a few times until crumbly, then place in a bowl. Next add the walnuts to the food processor and pulse a few times before adding them to the same bowl, then stir in the tamari and spices. Spread this mixture out in a thin layer on a baking sheet lined with parchment paper and bake for 30 minutes then give it a stir and bake for another 10 minutes until lightly golden brown. To make this taco salad, I started with a bed of chopped spring mix, but any kind of lettuce or tender greens will work. Then on top of that I added guacamole, my roasted corn salsa, shredded purple cabbage, the walnut cauliflower crumbles, a drizzle of cashew sour cream and a squeeze of fresh lime juice. It's the perfect zesty summer salad! This taco meat replacement is also amazing in actual tacos. 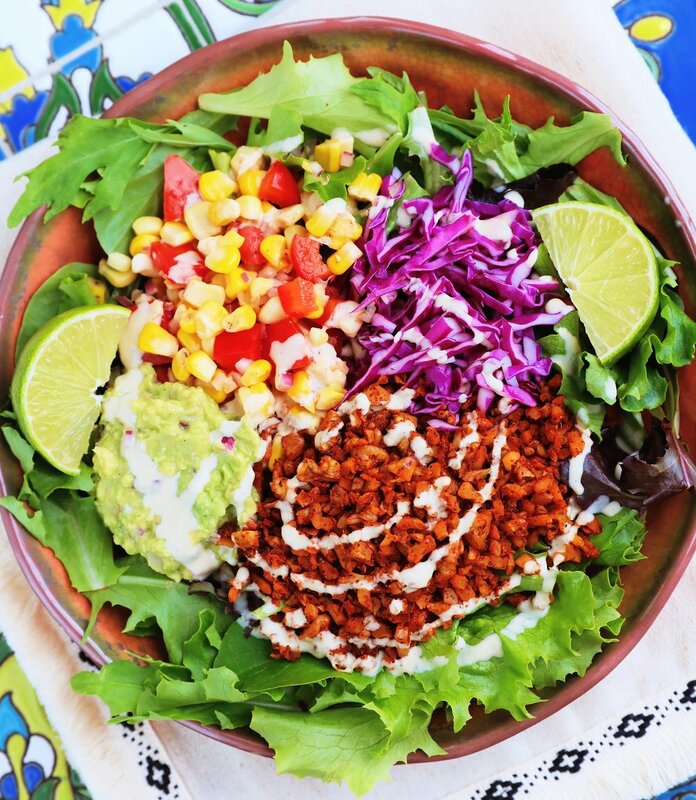 in grain bowls with rice or quinoa, added to tomato sauces to make a meaty bolognese sauce, in wraps, or pile it in a big lettuce or cabbage leaf instead of a taco shell- the possibilities are endless! 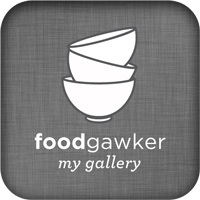 What are some of your favorite summer salad recipes? 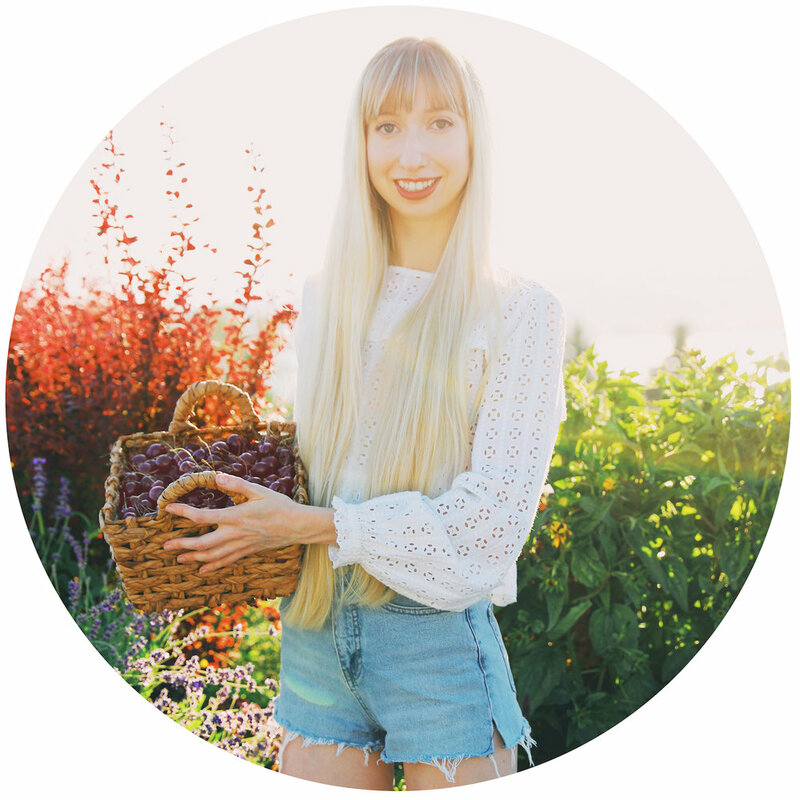 If you try out this recipe I'd love to hear what you think of it! If you love refreshing and zesty salads and are looking for a healthy alternative to fresh mozzarella, you'll love this salad recipe! I have been loving heart of palm as a mozzarella replacement in salads lately. The texture and mild flavor is similar to fresh mozzarella and with the right dressing it can taste very similar. For convenience, I like to use canned heart of palm which is readily available and easy to drain, slice, and serve. I added in white beans for extra protein and fiber along with fresh cherry tomatoes, cucumber, avocado, and sliced green onion. The dressing is what makes this salad so delicious and zesty. It's super easy to throw together quickly in the blender. First, add to the blender the lemon juice, water, vegan cashew parmesan (or nutritional yeast), garlic, and mustard and blend until combined. Then, add in the basil leaves and pulse a few times until shredded into small pieces. It's amazing how flavorful this dressing is with no oil needed! 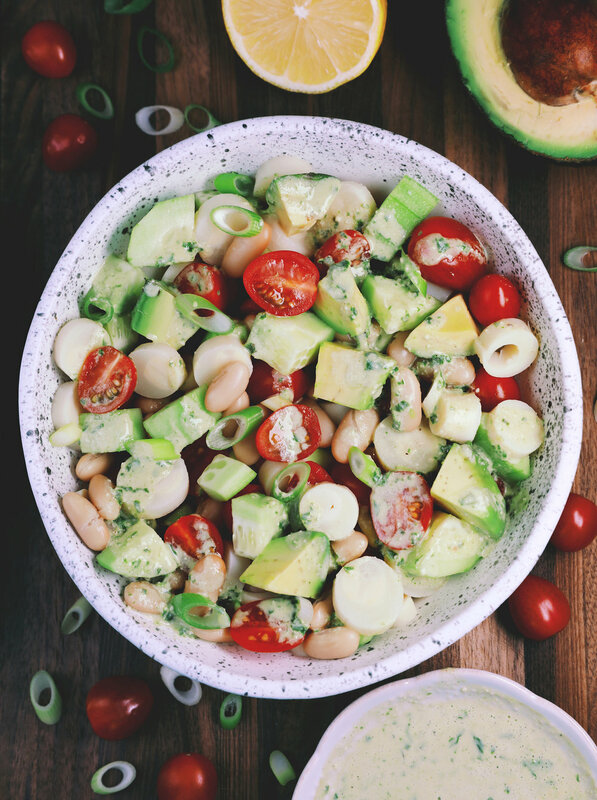 The lemon juice and fresh basil in combination with cherry tomatoes, avocado, and heart of palm makes for a deliciously healthy fresh salad that's actually so filling and satisfying. 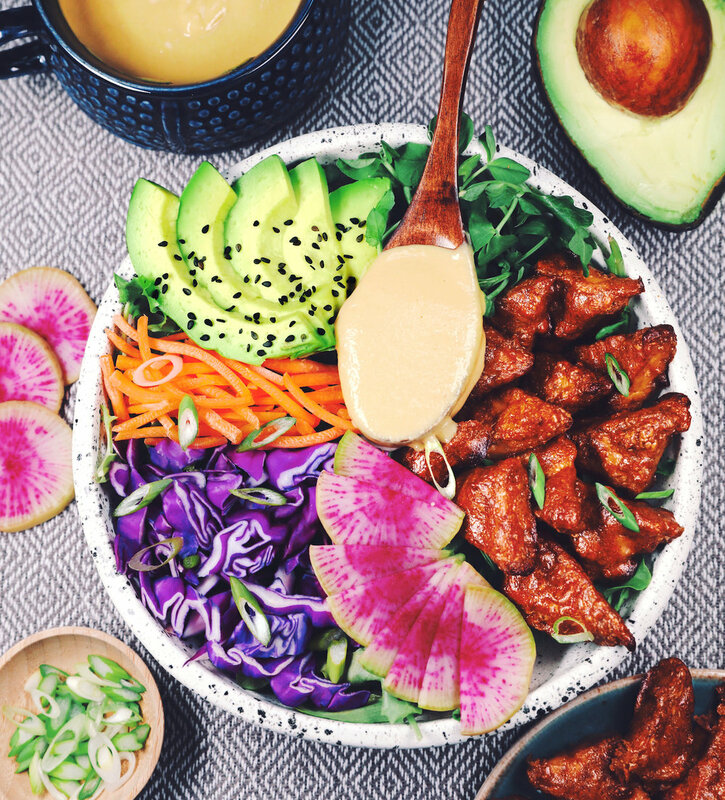 This salad with marinated almond butter tempeh and creamy miso ginger dressing has been my go-to salad recipe for the past few weeks. It's filling and savory from the marinated tempeh but also refreshing and spicy from the creamy dressing made with fresh ginger and fermented miso paste. I used to think I hated tempeh, no matter what I did it always tasted bitter. Eventually I learned that tempeh really needs to be steamed first to remove the bitter flavors, but even then I didn't know what to do with it. 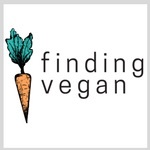 Then I found this recipe for marinated peanut butter tempeh by Minimalist Baker and that changed everything for me. I adjusted the recipe to be oil free and also slightly lower in sodium, but still maintain that delicious flavor, and now I can't get enough of it. I love adding it to fresh salads, but it's also wonderful in warm grain bowls with rice and steamed greens, as shown below. 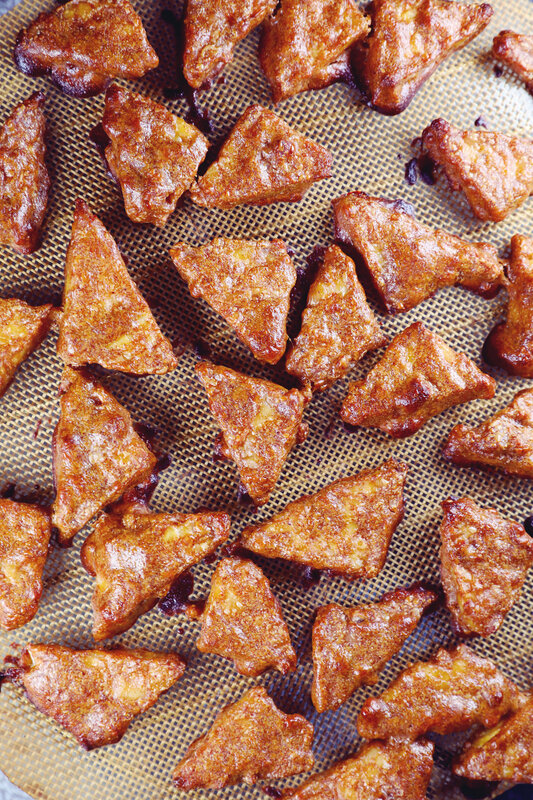 I like the tempeh cut into little triangles. Cut the tempeh in half the long way first and then cut the thin pieces into triangles. Making the marinade for the tempeh is really easy. Just mix together the marinade ingredients in a bowl and gently stir or toss the tempeh until it's fully coated. If I have time I try to let it sit in the marinade for as long as possible (2-24 hours), but usually I only have about 15 minutes. Even in that small amount of time the tempeh still picks up a lot of flavor. Lay out the marinated tempeh pieces on a lined baking sheet and bake for 20-25 minutes at 400 degrees until golden brown. 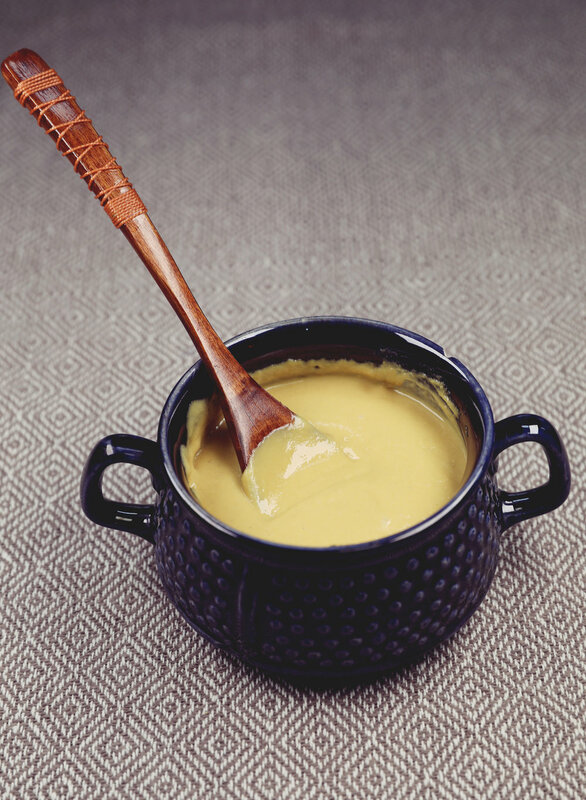 If you like ginger, you're going to LOVE this salad dressing recipe. As always it's oil-free, vegan, and made with healthy whole food ingredients. 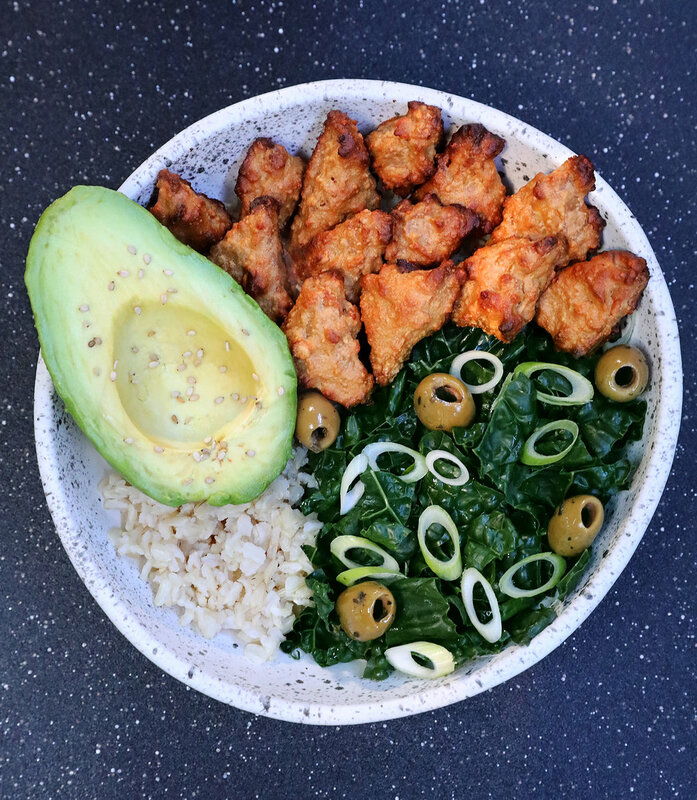 It's got quite a kick to it and goes so well with the almond butter tempeh in this salad bowl. All you need is a high speed blender or food processor. 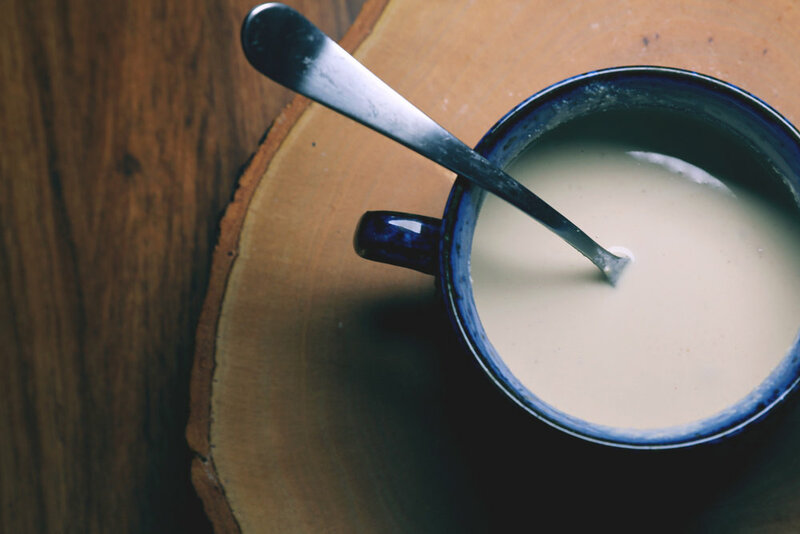 Add all of the ingredients and blend until it's super creamy and no chunks remain. Store the dressing in a sealed container in the fridge and it will keep for 4-5 days for use in salads all week. I hope you enjoy this flavorful salad recipe! 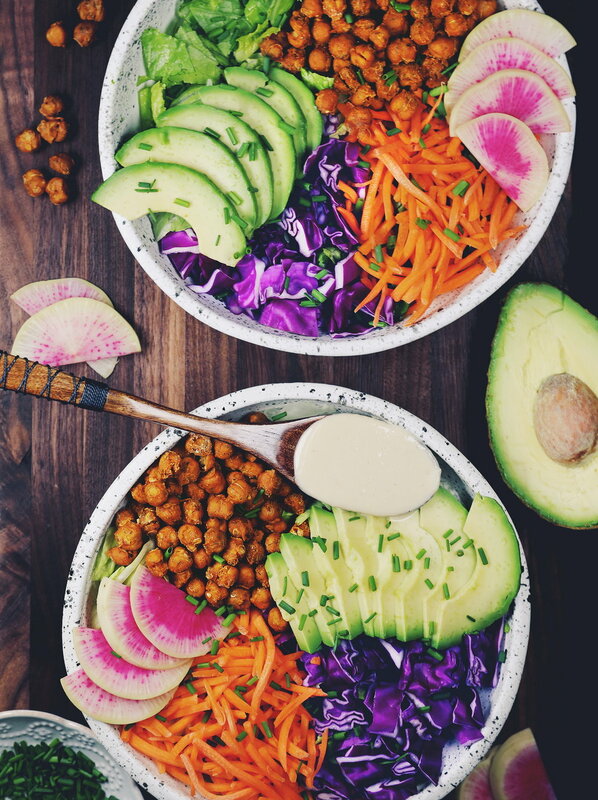 This colorful salad with roasted chickpeas and creamy caesar dressing is the perfect way to start off the new year feeling nourished and glowing from the inside out. The chickpeas are seasoned with a cheesy onion flavor that makes them taste like croutons. The spice paste, which makes the flavors fully coat the chickpeas, is made with the liquid from the can of chickpeas rather than oil. This makes for a much healthier option which still packs a ton of flavor. I've adapted this brilliant chickpea roasting method from this recipe by A Virtual Vegan. These chickpea croutons are perfect in a salad but they also make a great snack to enjoy on their own! The dressing is super simple and requires no blending! It takes only 5 minutes to prepare and tastes so creamy and delicious. It's similar to a creamy caesar dressing; tangy, thick, and salty, but made almost entirely with unrefined whole food ingredients. Store bought dressings are made to sit on a shelf for months so they are often filled with questionable preservatives and processed oils. To pour one of these dressings over an otherwise nutrient-packed healthy bowl of fresh vegetables would undo a lot of the health benefits of eating a salad in the first place. Now that I've learned how to make my own dressings, I can't imagine ever going back to store-bought, especially when they are this easy to make! Feel free to choose any of your favorite crunchy veggies for this salad. My go-to salad ingredients lately tend to be romaine lettuce, purple cabbage, carrots, radish, and green onions or scallions. I love adding avocado to this salad bowl, but if you don't have any it's perfectly delicious without it too. This is a great recipe to meal prep for a week of healthy salads. 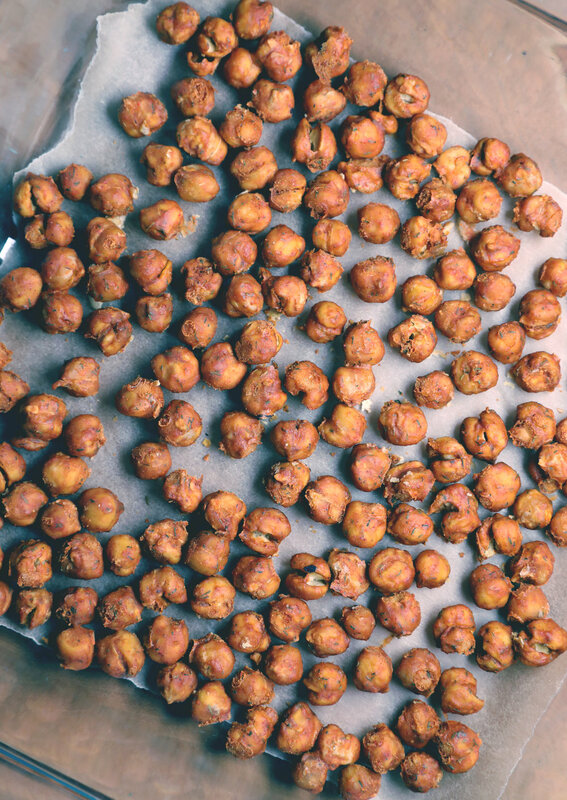 Double the batch of crispy chickpeas and allow them to sit inside the oven while it cools to make them stay extra crispy for longer. Then store them in a glass jar and add them to salads and whole grain bowls all week. Make sure to make an extra large batch of the creamy dressing too!